Hirofumi Goto aka Rondenion is a Japanese producer who has maintained a rather mysterious image. With a decade of releasing music behind him, it was only in 2013, around the release of his debut album Luster Grand Hotel, that he finally began giving interviews. His releases on labels such as Chicago’s Still Music, Holland’s Rush Hour, and Germany’s Yore have delighted dancefloors and gained support from DJs around the world. But, with so little information available, many of Rondenion's listeners may still not know that he is from Japan. Rondenion’s deep house productions have a certain combination of rough texture and soulful groove that remind us of the likes of Moodymann and Theo Parrish. It comes as a surprise, then, that he has a background in classical music education and his first encounter with dance music was through a mainstream J-pop band. Rondenion currently makes his music in his hometown in Mie prefecture. Yuko Asanuma had a chance to meet him in Tokyo to discuss production approaches and inspirations. You have a classical music education, is that right? Yes. I took part in school brass band in junior high school, and the advisory teacher told me “you have a talent in music. You have a good sensitivity, so you should play saxophone.” So I got myself into music high school by playing sax. Did you enjoy your music education at the time? To be honest, it wasn’t exactly what I was looking for. Actually, my first love for music developed as a child, through listening to TM Network, a Japanese pop band that introduced me to synthesizers. They got me interested in electronic sounds and instead of playing a single instrument, I was more curious about making a whole music piece on my own. In the school brass band, there was a friend who played “Electone” (an electronic organ system that was developed by Yamaha,) and the advisory teacher at school also played synthesizer. So there was a Yamaha SY 85 in our school. When I had a chance to play with it, I thought “this is what I want!” I learned how to play it from them, and started a band with a friend. As a result, my passion for sax started to fade. However, in Mie, where I lived at the time, I was considered a very good player because there was not much competition. I then entered a music college in Tokyo, but by that time I was completely into making my own music and couldn’t care less about playing saxophone. I stopped going to the college after three days. [laughs] From then on I just focused on making demo tapes and sent them out to labels. After a few months I got signed to a Japanese label called Frogman Records and had my first record out. What were you using to make music then? A Yamaha A3000 sampler, and a multi-track recorder, the KORG D8. I was making my tracks based on samples. I used a combination of my own recordings and sampled materials from other sources. How did you arrive at this hip hop approach after having been inspired by a synthpop band like TM Network? Towards the end of TM Network’s career, they got more and more into four-on-the-floor dance beats. That really was the introduction to dance music for me. Around the same time, I heard stuff like 808 State and Yellow Magic Orchestra remix albums, and got to know about house and techno. For a while I tried programming sequenced beats, but then when I heard hip hop, it struck me and made me wonder, “how is this music made?” And that’s how I discovered sampling music. I learned how to make the tracks that weren’t possible with just sequenced beats. That was the moment I found a way to make the music I always wanted to make. You changed your artist name from Hirofumi Goto to Rondenion, and had your first EP releases on Still Music from Chicago. How did this happen, and why did you decide to work with an international label? At that time, Frogman Records was in decline, and there were not many other options left in Japan. So I had to look outside out of necessity. Additionally, there were almost no Japanese house producers who had become successful through a Japanese label. So I decided to send my demos to a few labels I was fond of. When your music is released outside of your own country, it’s not easy to see the reaction. So I thought it would be important to be able to search my name on the internet. Hirofumi Goto is not a very unique name. So, in order to track myself, I needed a name that’s a bit unusual. When I searched Rondenion, I had no hits! This was around 2003. After I decided that my artist name would be Rondenion, I only approached foreign labels. Your name doesn’t sound Japanese at all. Even in Japan, you seemed to have received recognition only after your records were imported back. No one in Japan knew I was Japanese either. I don’t think anybody could tell from the sound of my music. That was a part of the fun as well. In Japan, there’s this skepticism among music fans if you’re a Japanese producer. Your record will be sorted into the “Japanese” section. So I intentionally picked a name that doesn’t sound Japanese. Many Detroit beatdown or house producers have a particular obsession with hardware gear. You’re clearly influenced by them musically, but you didn’t consider following the same methods? In my case, I had the skills to play piano and program before getting into that style. It actually makes it more difficult to work with using only hardware. I get compliments like “Rondenion’s music has distinctive chords,” and that comes from my musician background. I consider that as my advantage, and my current set up works best for me. I also grew up with classical and J-Pop music which has much more development than simple loops, so I needed more than a hardware sampler. 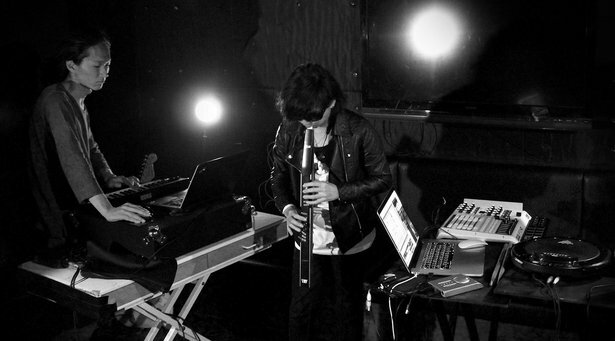 When you perform live, you are always using an electronic controller that looks like a saxophone. Yes, it’s a wind controller called AKAI EWI4000S. It’s connected to a sax simulator software called Mr. Sax. I run the track from Live, control it with AKAI APC40, and play EWI4000S on top of it. As the name says, Live is really great for live performance. Especially assigning MIDI controllers, it’s super easy. It’s software but I can add physical operability and customize it just like a hardware. I’ve recently started using Push in my studio as well. I can make interesting beats with it. A very recent release from my label, No Milk’s remix EP called Re:Colors, contains my remix which was 90% made with Push. I used Cubase for the last touch but only for about 10%. Your music has rather rough textures or slightly distorted touches to some of the sounds. How do you design your sounds? That’s something I don’t really pay particular attention to. I make basically everything with software, but I don’t spend so much time designing sound. My kind of music is not made by writing notes, creating melody lines, arranging them and then record. The process of playing is recorded and becomes a piece. So the sound and melody are two sides of the same coin. I never make melody first then make sound afterwards. When I find the sound I like, the melody just comes out naturally. It’s a cliché question, but where do you get your inspiration or the first catalyst for a new song? It’s a cliché answer, but it comes from my everyday life. It may sound like a very boring answer, so let me elaborate [laughs]. Music-making is very much like conversation between people. No matter what topics you had in mind, the flow of conversation changes depending on how the other person responds. If it involves many people, then you could end up talking about something completely different. So, depending on how a bass drum sounds, it determines how the high hats should respond. For example, the fact that I’m giving this interview today will bring something to my future life. It’s the same with the music I make, because it reflects the changes I experience. In other words, it can be explained by the concept of “the principle of causality.” It’s not about each occurrence and consequence, but how these happenings affect my life in the end. It’s about capturing the changes in the orbit of life in music. The orbit of course changes again by the act of making music, releasing music and receiving responses. So when I make music, I can observe how I’ve changed. It’s a way to look at myself objectively. You founded your own imprint, Ragrange Records, in 2011 to release music independently and also provide an outlet for other artists. You released another full length again this year as a part of a Japanese producer team, Ragrange Symphony. What other visions or ambitions do you have for yourself now? Essentially, all living organisms need diversity to survive, and the same can be said about human beings. On the other hand, humans have the function to keep ourselves at normal state. So if our body gets too warm, it works to cool down. If some foreign matter enters the body, it works to eject it. The same principle can be applied to the things we create. So we naturally tend to feel comfortable with average things unless we become conscious about our choice. If you’re unconsciously “averaged,” you tend to choose what’s normal, and you tend to do things in a “normal” way without thinking. I personally make an effort to throw away my initial ideas and melodies I easily come up with. I wanted to work in a team because I wanted to create music I couldn’t on my own. I want music to be something that make people think, “wow, I had never imagined it to be like that” and may even change the way they perceive life. For more information on Rondenion and Ragrange Records, visit Ragrange Records official site.